JOHN McGuinness broke his own SES TT Zero record in today’s Isle of Man TT Races with his teammate Bruce Anstey again following him home, as he did last year to win his 22nd TT. It was John McGuinness who was first away ahead of Anstey, but it was the Kiwi at Glen Helen who took the lead, albeit by only a second. The Mugen pair had already made their mark 17 seconds ahead of third placed Lee Johnston on the Victory Parker Racing. Johnston’s team-mate Guy Martin was a further nine seconds behind. William Dunlop was supposed to ride the second victory electric bike, but due to a crash at Laurel Bank prematurely ending his TT 2015, he asked his Tyco BWM team-mate Guy Martin to take the reigns. McGuinness moved into the lead at Ballaugh Bridge and eked out a lead of over two seconds from Anstey. Johnston and Martin continued their challenge for the final podium spot, but the Northern Irish rider had established a lead of over 10-seconds. Robert Wilson consolidated fifth place for Belgium’s team Sarolea Racing whilst James Cowton and Michael Sweeney were going head-to-head for sixth and seventh respectively. 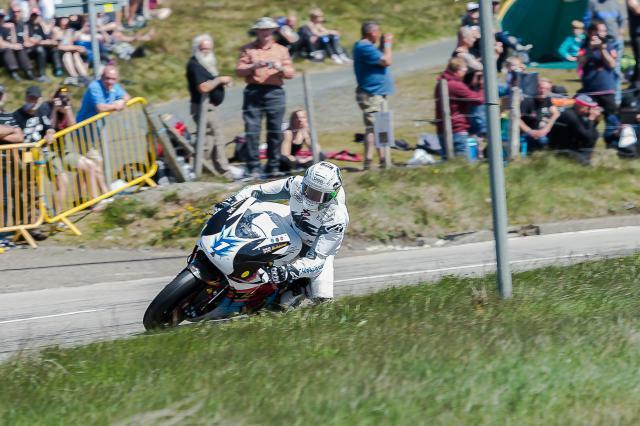 Anstey began to do his usual charge over the Mountain and the gap closed to leader McGuinness to less than three seconds, but the Morecame Missile held onto the win with a new lap record of 119.279mph. Anstey also broke the previous lap record. Didn't Guy Martin say he kept hold of the bars?